DRAGON’S KEEP—Admitting that the troves of valuable items scattered everywhere made it difficult for him to put food on the table, video game blacksmith Torg Nailbender was reportedly struggling Monday to compete with all the random chests full of free armor all over the kingdom. “It’s hard to make a buck when all any potential customer has to do is wander through the woods or a nearby dungeon and pick up a bunch of armaments totally gratis,” said Nailbender, noting that the swords, shields, and crossbows were readily available and frequently more powerful than the ones he could provide. “It’s not fair that I have to slave away for hours to construct a dagger or two, but any jerk can just stumble into a whole set of scimitars brimming with enchantments. The market is completely saturated. 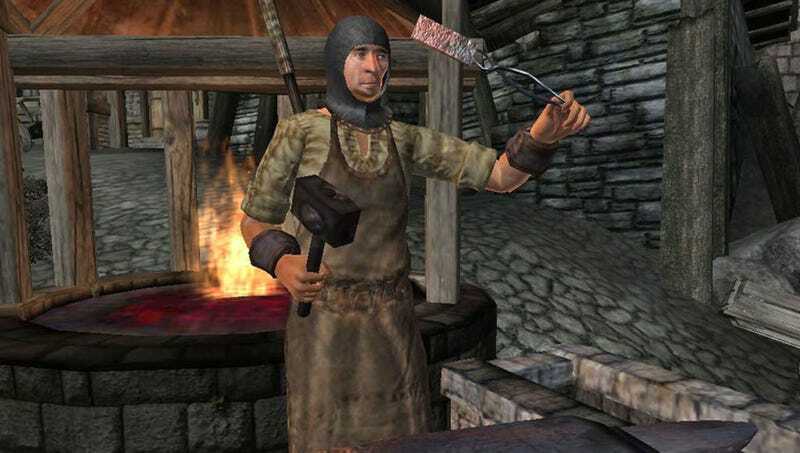 And that doesn’t even begin to account for the fact that there’s another blacksmith just like me in every adjacent town so my entire clientele consists of people who just happen to be passing through.” Nailbender added that his economic burden was further exacerbated by customers already flush with treasure coming to his smithery and forcing him to buy their weapons for fifty gold pieces each.